Tofo is small little fishing village that has some of the best diving in the world, from encounters with giant mantas and whale sharks to amazing macro life like Sea Moths, Frog Fish and Sea Horses. From June to November you will encounter an amazing Humpback Whale migration. 19 dive sites including Manta Reef keep the divers busy with underwater discoveries. The beach is endless golden sands along the Indian Ocean, inviting to stroll along and laze in one of the beach front restaurants watching the sky turn colors with the sun setting behind you over the bay. Ocean Safaris are very popular for snorkelling with whale sharks, surely the experience of a life time to get so close to these majestic giants. Meet the locals in a vibrant little market that in addition to souvenirs and colorful clothing sells the tastiest prawns one can imagine, freshly caught in adjacent Lake Inhambane. Cook some up in water from the ocean, dip into local piri piri hot sauce or garlic butter and you will never want to leave again. When to go: sightings of 50-strong congregations of whale sharks are not uncommon from October to March. Giant Mantas can be seen year round. Relax in the peaceful and cosy environment perched above the Indian Ocean. The coastal town of Vilanculos acts as a gateway to Mozambique’s Bazaruto Archipelago – a chain of four main islands: Bazaruto Island, Benguerra Island, Santa Isobel and Santa Carolina (formerly known as Paradise Island). A marine national park covers most of the archipelago, protecting the exquisite marine life in these turquoise seas. A beach or dive holiday in these islands combines well with a safari to southern Africa. Bazaruto/Benguerra Islands are known as the ‘Pearls of the Indian Ocean’ and are perfect island escapes in the Indian Ocean just off the coast from Vilanculos. Vilanculos can now easily be reached by direct flight from South Africa’s Kruger National Park airport. 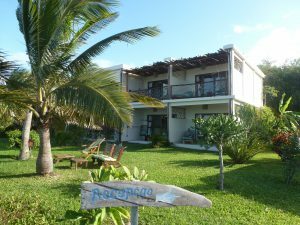 Located on one of the most beautiful and lively beaches in Vilanculos, Casa Babi is a Boutique Hotel with a B&B atmosphere and very attentive owners to your needs. Best place for serious divers as a PADI certified dive shop is connected to it. Odyssea Dive takes divers and snorkelers alike to the Bazaruto Archipelago offering some of the best diving and beaches in Africa. This new boutique hotel is located where the azure waters of the Indian Ocean touch the palm fringed beaches of Vilanculos on mainland Mozambique. It is the ultimate destination for visitors wanting to experience colourful local culture as well as the fabulous beauty of the Bazaruto Archipelago. Active travellers choose from diving, dhow trips to the islands, fishing, power boating, snorkelling, canoe trips, kite surfing, stand up paddle boarding, tuk tuk tours, beach horse rising, craft shopping and last but not least being pampered in the spa. Imagine and unspoilt island within a marine park, deserted beaches of pure white sand that extend for miles, sparkling turquoise seas crisscrossed by dhows plying their trade, sunny days and star studded nights….Villas are nestled along one of the last undiscovered stretches of beach in the world, with all the creature comforts you could wish for, sparkling private pools, fresh fish and seafood, diving, big game fishing, dhow sailing, snorkeling and more. An exquisite piece of paradise in the middle of the Indian Ocean, this resort is a magical destination where time stands still and legends come to life. Authentic African character and charm blend with the echoes of distant history in a lodge that cherishes the simplicity of tradition, while celebrating the Arabic influence of its past. Quaint casitas overlook silver sands lapped by turquoise waters where rare manatees call to life ancient tales of mermaids and mariners. The Quirimbas Islands lie in the Indian Ocean off northeastern Mozambique, close to Pemba, the capital of the province of Cabo Delgado. The archipelago consists of about 27 islands, including Ibo, Matemo, Medjumbe, Quirimba, Metundo, Quisiva and Rolas Island. Originally home to fishing settlements, the islands population grew around Arab trading posts and thrived under the Portuguese trading routes when it was known as the Ilhas de Sao Lazaro (Islands of St. Lazarus). Today, many of the islands are uninhabitated. These islands are known for their high-quality diving sites, including phenomenal drop-offs, some up to 400 meters. The Quirimbas National Park, spanning an area of 7 500 km², includes the 11 most southerly islands, which are partly surrounded by mangroves. The park was established in 2002. Imagine a remote Mozambican island lost in time and almost forgotten to the outside world for nearly a century. Picture grand, majestic architecture, some lovingly restored to their former glory while others have fallen into crumbling, marvelous ruins. Be whisked to an idyllic white sandbank beach and dive, snorkel or kayak some of Africa’s richest coral reefs. The island is also one of the oldest and most romantic settlements in Africa and is nominated for World Heritage Status. Discover the subtropical Quirimbas Archipelago aboard a dhow, dive and snorkeling pristine reefs and lounging on white-sand beaches. Retire to mobile eco-camps on uninhabited islands to sleep under starry skies. Wind up with a visit to the once prosperous trading center of Ibo Island, with its ancient forts and pirate lore. Scheduled and private dates available. Crusoe invented castaway chic, but Vamizi Island Lodge defines it with impossibly romantic timber villas strung loosely along one of the world’s most beautiful beaches. Simply grand or grandly simple – this lodge isn’t about the usual five star luxury and all modern cons, it’s about the more rarified pleasures of exclusive island life. Imagine wafting through muslin and filtered sunlight, flopping straight from your room into a private ocean and enjoying elegant lunches with your toes in the sand… It’s hard to compete with the perfect desert island, so we don’t. We just take what comes on the breeze, and mold it into a more civilized form. Beneath the surface of the Vamizi Seas is an outstanding reef scape – mountains, valleys, plateau and cliffs- teeming with a bewildering amount of sea life, from whales, dolphins, turtles and reef sharks to gregorian corals and giant clams. Vamizi Island lies right by the point where the south equatorial current splits. The emergent cool and warm currents sustain unusually large amounts of microscopic plankton and krill, a major food source that supports a vast array of species – up to 46 types of coral and over 400 species of fish. Simply put, whether you want to dive, fish, swim or bob, this is the place. The miles of unpadded white sand and wild bushy interior are a sanctuary for samango monkeys, coconut crabs and the 112 bird species that have been recorded as either resident or visitors, as well as being a haven for the more land-based creatures amongst us. Like the 100 turtles that nest on Vamizi’s empty shores and are irresistibly drawn to its peace, solitude and perfect harmony year after year, intrepid travelers and rarified pleasure seekers find it’s just the place to rest their weary fins. True hedonistic pleasure awaits you at the romantic and exclusive island getaway of Medjumbe Private Island. Set like a jewel within the glittering Quirimbas Archipelago, this private island is only half mile long and 1500 feet wide. A perfect vista of endless white sand and translucent sea mesmerizes guests. Untouched marine environment allows for spectacular diving, fishing, snorkeling, sailing, kayaking or simply relaxing…..
Azura brings it’s trademark African-chic style to Quilalea Private Island, a private, wholly uninhabited island paradise surrounded by the pristine waters of the Quirimbas Archipelago marine sanctuary. Azura at Quilalea is a hidden gem, somewhere to retreat from the hustle and bustle of daily life, with a relaxed and understated ‘Robinson Crusoe’ castaway style that belies the comforts and experiences on offer in the 9 seafront villas. Snorkel the island’s shores, dive from the main beach, kayak the mangroves or relax in a hammock beneath the giant baobabs on the island. Quilalea is the ultimate private luxury hideaway in a stunning undiscovered destination, an untouched paradise for the just a discerning few to discover. Contact Us for pricing which depends on season, length of stay and other special offers that might be available to you depending on your situation, such as honeymooners! ** Mozambique is malaria area and prophylaxis is advised.